The Legion of the Dragon are mighty ninjas. Stealthy and fast, their feats of dexterity cannot be beat. They have infiltrated countless stows of secreted knowledge, bringing back relics of exotic myth to their hidden base, leaving behind no sign that they had even been present. The few who have seen them skulking in the shadows can only speak of their surprising… height? Among the mighty Dragon Ninja Clan are whispered a few that possess extraordinary powers. Possessing the same remarkable quickness and stealth as the others in its squad, the Mirror Ninja still often goes unseen as they dart about the wilderness, seeking their treasures, whether candy or coin. Feared above all others, the Mirror Ninja is able to reveal to its opponents their own inner fears and then use them to hasten their defeat! In a matter of mere moments, all one’s candy could vanish into the Ninja’s tote and no trace would be left behind. 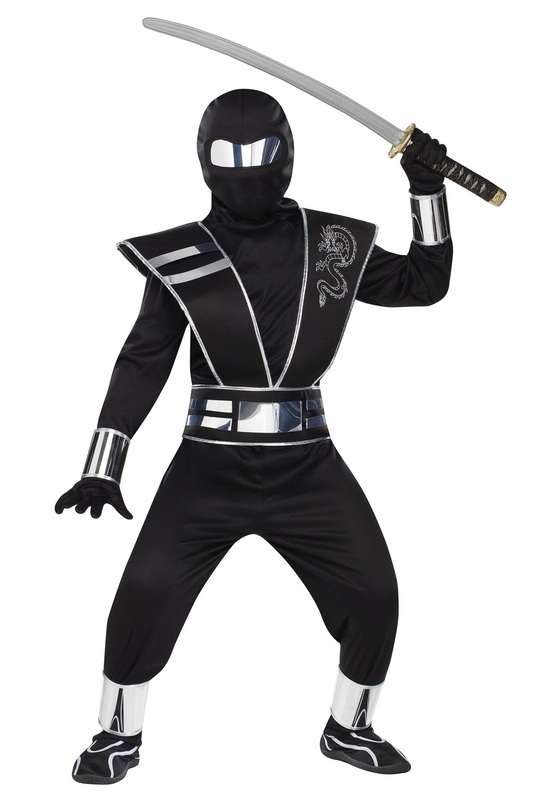 It is with warning, yet still excitement, that we bring to you the Child Silver Mirror Ninja costume that will mark your child having completed all necessary training to begin their most grand of adventures and ninjago missions: the candy acquisition! A long-sleeved pullover shirt with elastic-waist pants and short gloves make up the bulk of your tyke’s uniform. The black and silver-lined tabard shows the icon of the Dragon clan. But it is the hood that brings the most to this costume. The mirrored eye area is partly see through and reflective to any who dare look upon their foe. And, if you dare, you may fill the entire squad with the different colored teammates of black, white, red, and green. Add toy weapons for authenticity and greater candy-stealing might! Love it! Purchased for a 7 year old. He is out of his mind excited! Fits well. His hair is a bit big so the mask doesn't stay in place but he doesn't seem to mind at all. Sword is sold separately. Of course we purchased it along with other great ninja weapons. Not to mention, customer service was on point. I had a payment issue due to my own mistake, quick answer, above and beyond results.